2. A handy electrical outlet-surge suppressor which also grounds the BestTrack. This is a subject that has been discussed here on DerbyTalk. Static electricity, especially in winter with low humidity can build up to considerable levels. In trouble shooting problems by phone over the years, I have run into several situations where data was corrupted, and grounding the track cured it totally. The most interesting one was reminiscent of the spark gap days of early radio. It was an hour into the conversation before I finally learned he had a BestTrack set up in a barn, and had a space heater going, one of those that has a spark plug continually popping to make sure the flame doesn't go out. The problem only occurred when the heater was working. I told him to ground the track. He did, and no further problems. Grounding your track is not the same as joining commons in the circuits. Grounding brings your track from (sometimes) thousands of volts down to zero. 3. I regret I must end the half-off offer exclusive to DerbyTalk on Light Tree Model LT3E, which I posted as last season ended. Deadline to order is September 15 midnight. After that, it is back to posted prices. Last edited by John Shreffler on Wed Sep 09, 2015 6:17 pm, edited 2 times in total. 2. 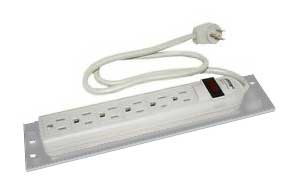 A handy electrical outlet-surge suppressor which also grounds the BestTrack. Please call us at 1-888-582-2299 or email us at sales@besttrack.com if you have any questions regarding the need to use a grounding power strip with our BestTrack products.